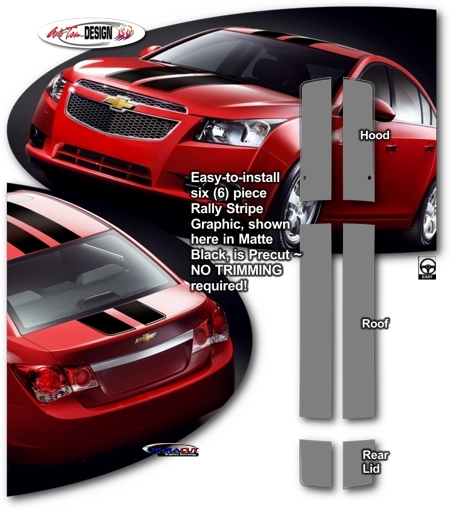 Set your '08-Current Chevrolet Cruze apart from the rest with this great looking Rally Stripe graphics kit. Featuring a 0.30" (7.62mm) pin highlight on Hood and Rear Lid Top pieces as shown, easy-to-install kit is packaged with PRECUT pieces, ready to install, in a wide variety of colors - NO TRIMMING required (except for vehicle models with Sunroof option)! Stripe package is not just a set of 10" (25.40cm) strips in a box. Kit consists of prefitted, tapered and contoured pieces as shown. Rally stripes are set to install with 4" (101.60mm) center spacing at time of installation. Trimmable Spoiler Kit #ATD-CHVCRZGRPH005 consists of two (2) 12" (30.48cm) long pieces that can be trimmed during installation for custom spoiler applications.